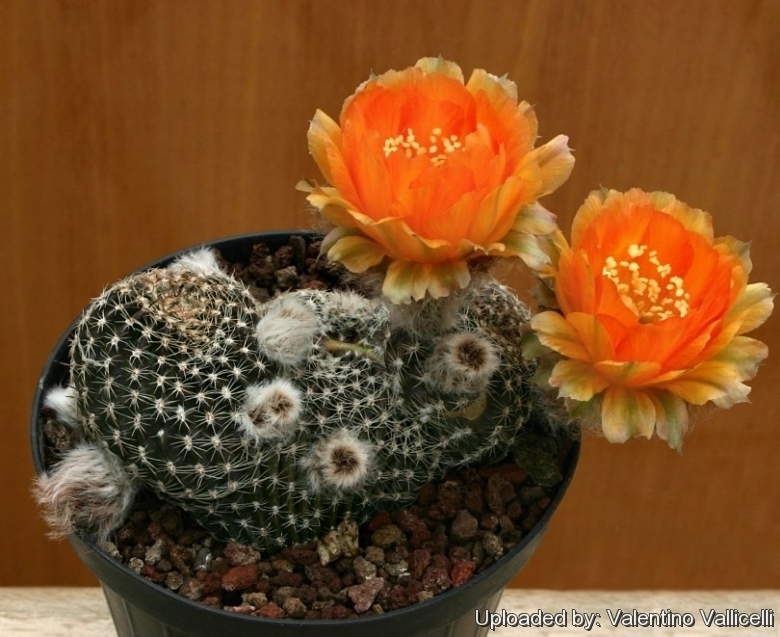 It is a small and quite cold-tolerant species from the high Andes. 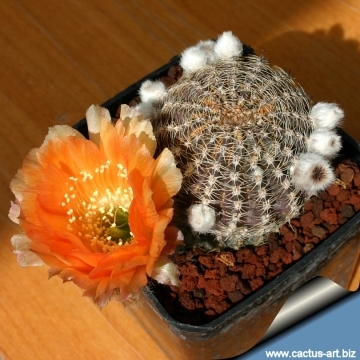 Description: Echinopsis densispina is a low growing cactus species with colourful flowers ranging from yellow to orange and red. It is an exceedingly variable species with a bit of variation throughout its range and some taxonomists recognize several varieties. The segregation of the many forms, varieties, and subspecies on the basis of spines morphology and flowers colour, however, is difficult to support, given the continuous range of variation in spination and flower colour over its geographic range. Habit: Solitary or forming clusters or cushions from a large tap root, it is a very variable specie with several different forms. Stem: Ovoid, greyish-green, dull green or brown-purplish-green, up to 8 cm tall and 5 cm in diameter. Ribs: Approximately 17, more or less notched, forming tubercles. Areoles: Yellowish-white, somewhat sunken, about 5 mm apart. Spines: Quite variable in form, length and number, forming a close network that shades and in many cases almost hides the body. 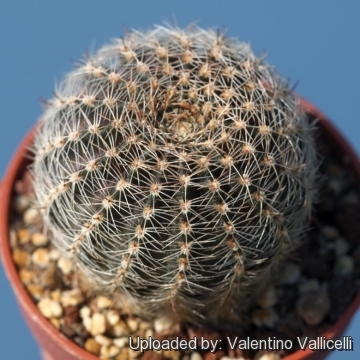 Central spines: 0 to 7, brown, with darker tips straight or somewhat curved. Larger at the base, 0,5 to 2 cm long. Radial spines: 16-22, spreading or sometimes appressed against the stem, bristle-like, flexible, whitish, 4 mm long. 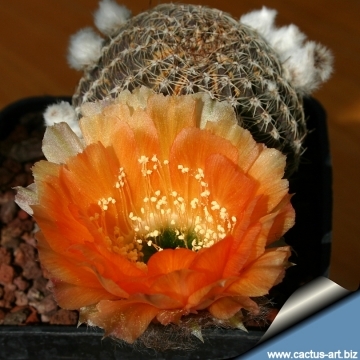 Flowers: The flowers occur in many colours, varying from yellow to orange and red, up to 8,5 cm long. 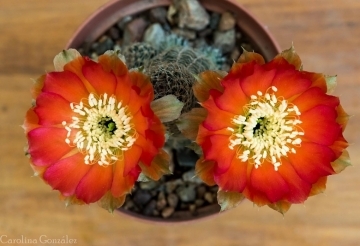 Cultivation and Propagation: Echinopsis densispina is a summer-growing species that offers no cultivation difficulty, not as badly affected by moisture as other cactus species. It makes great potted specimens. Watering: It should be watered regularly in Summer allowing to dry before watering again and kept drier in Winter. It is very drought-tolerant. 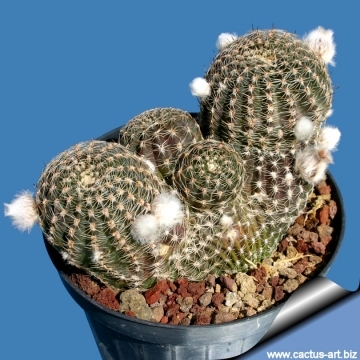 Hardiness: It can be grown outdoors in frost-free climates, needs anyway to kept above 5 °C and dry in winter. But it can tolerate temperatures down to -5° C (or even less) for very short periods if very dry and ventilated. During winter month, put them in a cool luminous place and encourage them to enter winter dormancy by withholding water and fertiliser over the winter as they will etiolate, or become thin, due to lower levels of light.